The Sundance Spa Store Vaughan opened in 2017 and is our 5th and newest location. We are very excited to represent the legendary high quality products of Sundance hot tubs and Finnleo Saunas right in the heart of Vaughan Mills. Located just off hwy 400, close to the entrance to Canada's Wonderland in the Coppa's Grocery Store Plaza we are excited to be entering our 2nd year in the amazing city of Vaughan. At The Sundance Spa Store in Vaughan, you will find an extensive selection of Sundance Hot Tubs and Finnleo Saunas, both traditional and InfraRed. Finnleo Saunas have been an industry leader for over 100 years and we are proud to provide such an excellent product. At our Vaughan location you will find a wide variety of saunas on display, including traditional sauna rooms and Infrared Sauna rooms in various sizes, from single person to large family units. 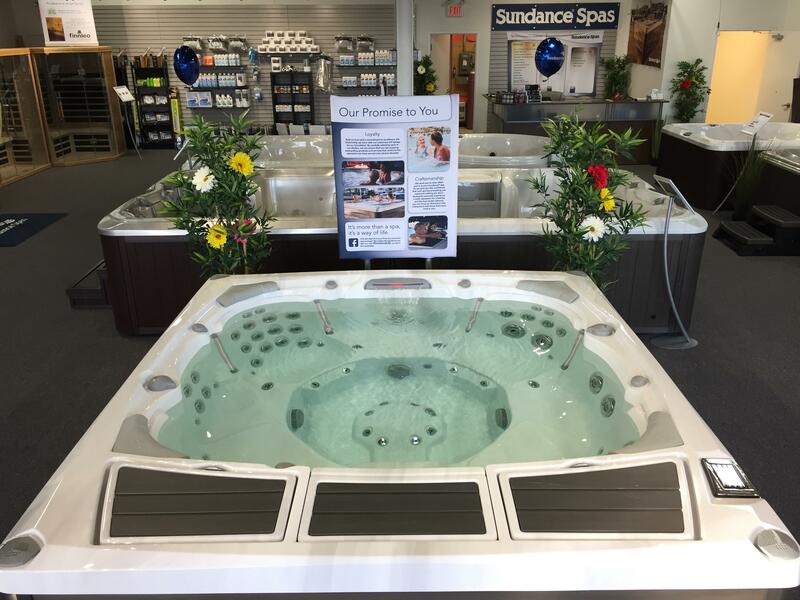 As our largest store yet, The Sundance Spa Store Vaughan has a large number of hot tubs on display including a number of spas that are filled and running so you can see them in action and experience the patented Fluidix Hydrotherapy Jets first hand. We also recommend that you sit in a dry model, so you feel just how comfortable and relaxing they are. The Sundance Spa Store Vaughan is where you will find the perfect Sundance® Hot Tub and Finnleo Sauna to improve your health and enhance your lifestyle all at the very best prices. Ask us about our famous Soak & Sweat package for the best possible deal on a hot tub / Sauna combo in the city! Choosing a Sundance® hot tub means getting our exclusive, patented Fluidix jet design that lets you adjust the water flow from oscillating to steady flow all without moving parts that can clog and wear out. Our patented ClearRay UV-C Water Purification System significantly lowers the amount of chemicals needed to maintain your hot tub and saves you valuable time and money. At The Sundance® Spa Store Vaughan, you will find a great selection of Sundance® Hot Tubs and Finnleo Saunas presented with dedication by our helpful and professional staff. Our goal is to assist you in finding the very best hot tub and sauna in Vaughan, all backed up by the best warranties, so you have peace of mind for years to come. If you are already a Hot Tub or Sauna owner and are in need of some supplies or accessories, come in and see us! We carry a full range of high quality hot tub chemicals, filters, fragrances and accessories as well as fragrances and accessories such as back rests, buckets, ladles and thermometers for use in your sauna.